Heart rate refers to the number of heart beats per minute, or bpm. A normal heart rate for an average adult, according to the Mayo Clinic, is between 60 and 100 bpm. As you age, your heart rate will gradually slow. There are a variety of factors that can raise or decrease your heart rate, including exercise, fear and anxiety, medications, some illnesses and diseases, and illicit drugs or alcohol consumption. The heart is a muscle responsible for pumping oxygenated blood to all of the organs, tissues and other muscles in the body. Kids Health reports that the heart accomplishes two tasks simultaneously: the right side receives blood from the body and pumps it to the lungs, and at the same time the left side receives blood from the lungs and pumps it out to the body. In recent years, it has been revealed that moderate alcohol use might help protect against heart disease by raising good cholesterol and reducing the accumulation of plaque in the arteries. The Women’s Heart Foundation reports that alcohol has mild anti-coagulating properties and might help prevent blood clots that can lead to heart attack or stroke. For men, the Centers for Disease Control and Prevention suggests drinking no more than two drinks per day and only one drink per day for women. 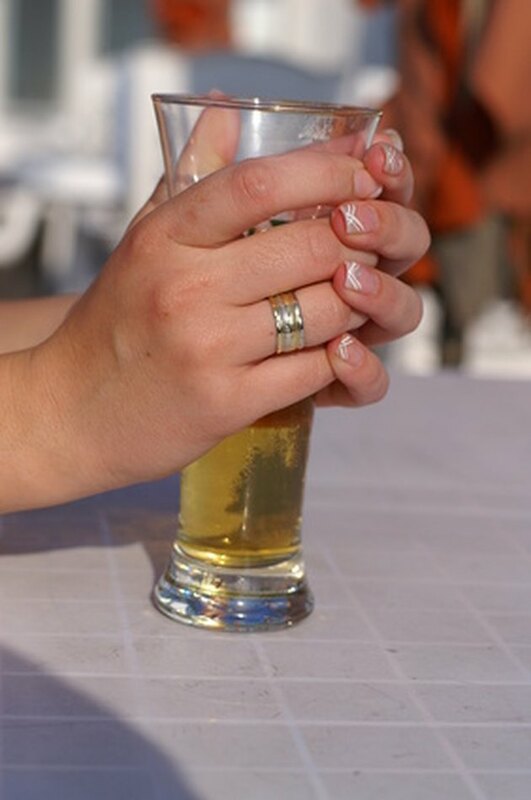 The Women’s Heart Foundation explains that moderate to heavy drinking can damage the heart over time. It can cause abnormalities including high blood pressure, an enlarged and weakened heart, congestive heart failure and raise levels of triglycerides, further stressing the muscle. An increased heart rate is one symptom of these conditions. When you start drinking, according to the American Heart Association, the immediate effects of alcohol could cause your heart rate to increase slightly by acting as a vasodilator, causing blood vessels to dilate and blood flow to increase. As drinking continues in one sitting, your heart rate will slow. Hypoglycemia, according to the Mayo Clinic, is characterized by an abnormally low level of blood sugar. It is a condition typically associated with diabetes, but it can be caused by excessive alcohol consumption. Drinking heavily on an empty stomach can block the liver from releasing glucose into the bloodstream, resulting in a hypoglycemic event. Symptoms of hypoglycemia are similar to intoxication, but unlike inebriation, it can cause heart palpitations. The National Institute on Alcohol Abuse and Alcoholism reports that chronic, heavy drinkers raise their risk of developing hypoglycemia because they often consume too little glucose. Also, the body’s glucose production is slowed while alcohol is being processed by the liver. How Long Should You Wait After Exercise to Drink Alcohol?